What does it mean Samoa is blessed through Ms. Opapo, Prime Minister Tuilaepa? About a month ago, the story says, a young woman has been doing for sometime what she apparently enjoyed doing, when she was alone. And when she wrote, the story explains, it soon became apparent that she was not using normal words in her writing the way you and I do. Instead, she was using awkward-looking characters and strange words so that to those around her, they were of a foreign language that not one of them could understand or decipher. And as she was now attracting much attention with curious people turning up all the time to watch her work, her “writing” remained a mystery to everyone. And then Prime Minister, Tuilaepa Sailele Malielegaoi, took an interest in Ms Opapo’s enticingly unusual writing, and soon afterwards it was mystery no more. And how did Tuilaepa unravel the mystery? He told the Samoan media last week: “I verified Ms Opapo’s writings with the Jewish High Commission in New Zealand. “I informed Samoa’s High Commission in Wellington to contact the Jewish Ambassador about the writing,” he also said. Explained Tuilaepa: “This was how it’d been revealed that Ms. Opapo’s ‘writing’ was in ‘Ancient Hebrew’. He also said “the translation revealed that on the 21st August you will be given a message. “I have chosen you on the mission of peace because of the division amongst (people) and the differences in (their) views and you are the messenger of peace. “On the 18th December, the message of peace should be made public. “Do not worry but believe in me, for there is no fear in love and perfect love expels fear. He said “if any event like this happened to a country, it means Samoa is blessed through Ms. Opapo. Still, Tuilaepa is of the opinion that the “message” he’s talking about is bound to be frown upon by many. So who is Satan anyway? Why is he “worried” about him if he believed he is someone else? Incidentally, what is Tuilaepa’s advice to those who worship Satan if he were asked? Anything else is as insignificant as the simple leaf rotting on the roadside. Still, let’s remind one more time that whatever he says will either embolden or dishearten. For instance, let’s take a look at that prediction of his, where he said: “… if any event like this happened to a country, it means Samoa is blessed through Ms. Opapo. We look forward to that day. 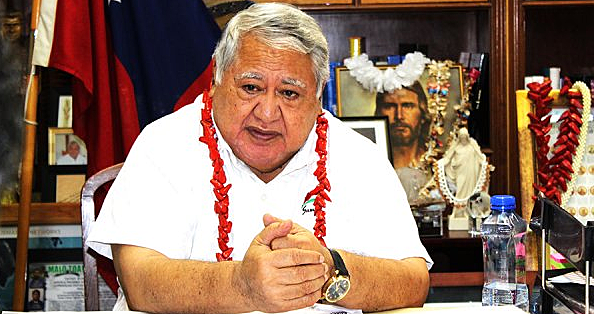 In the meantime, what has become of Prime Minister Tuilaepa’s plans to change Samoa’s Constitution so that Christianity is declared this country’s sole religion, and all the others are deemed unconstitutional and illegal?